Today we will learn about resistance welding principle, types, application, advantages and disadvantages. Resistance welding is a liquid state welding process in which the metal to metal joint created in liquid or molten state. It is a thermo-electric process in which heat is generated at the interface surfaces of welding plates due to electric resistance and a controlled low pressure is applied to these plates to create a weld joint. It is named as resistance welding because it uses electric resistance to produce heat. It is a very efficient pollution free welding process but its applications are limited due to its high equipment cost and limited material thickness. This heat is used to melt the interface metal to form a strong weld joint by fusion. This process produces weld without application of any filler material, flux and shielding gases. It is simplest type of resistance welding in which the work pieces are held together under pressure of anvil face. The copper electrodes are brought in contact with work piece and current start to flow through it. The work piece material applies some resistance in flow of current which cause local heat generation. At the interface surfaces the resistance is high due to air gap. The current start to flow though it which melt down the interface surface. The amount of current supply and time should be sufficient for proper melting of interface surfaces. Now the current stopped to flow but the pressure applied by electrode maintained for a fraction of second, while the weld rapidly cooled. After it, the electrodes remove and brought to contact at other spot. It will create a circular nugget. The nugget size depends on size of electrode. It is generally about diameter 4-7 mm. 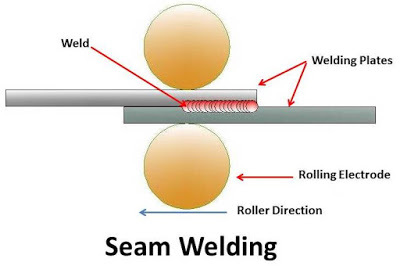 Seam welding is also called continuous spot welding in which a roller type electrode is used to flow current through work pieces. First the rollers are brought in contact with work piece. A high ampere current is passed through these rollers. This will melt the interface surfaces and form a weld joint. Now the rollers start rolling at work plates. This will create a continuous weld joint. 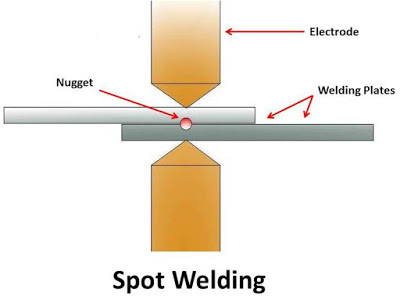 The timing of the weld and movement of electrode is controlled to assure that the weld overlap and work piece does not get too hot. The welding speed is about 60 in/min in seam welding. It is used to create air tight joints. 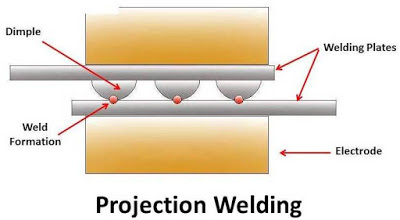 Projection welding is same as spot welding except a dimple is produced on work pieces at the location where weld is desired. Now the work pieces held between electrode and a large amount of current pass through it. 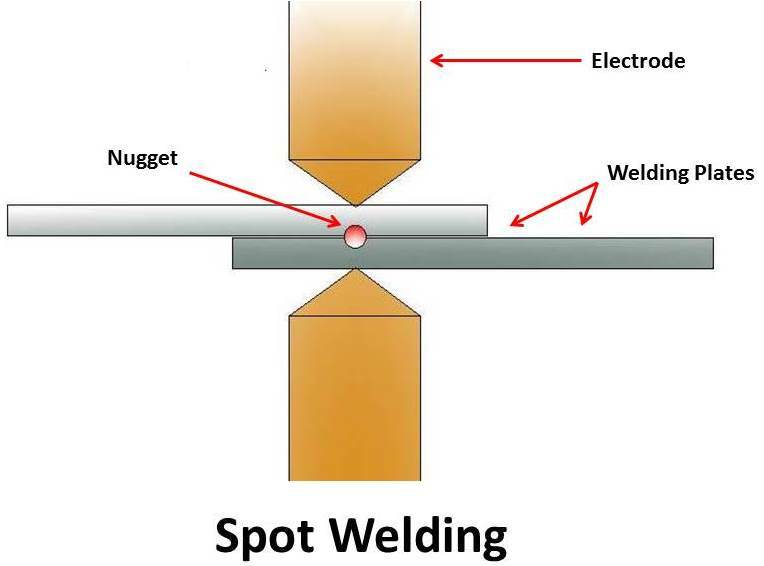 A small amount of pressure is applied through electrode on welding plates. The current pass through dimple which melt down it and the pressure causes the dimple flatten and form a weld. It is another type of resistance welding which is used to weld tubes and rods in steel industries. In this process, two work pieces which are to be welded will be clamped in the electrode holders and a high pulsed current in the range of 100000 ampere is supplied to the work piece material. In this two electrode holders are used in which one is fixed and other is movable. Initially the current is supplied and movable clamp is forced against the fixed clamp due to contact of these two work pieces at high current, flash will be produced. When the interface surface comes into plastic form, the current is stopped and axial pressure is increased to make joint. 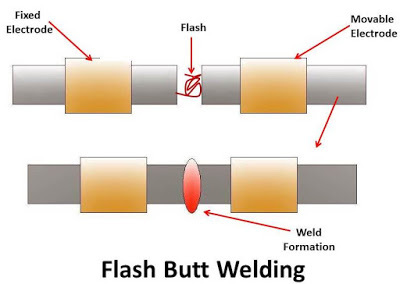 In this process weld is formed due to plastic deformation. Resistance welding is widely used in automotive industries. 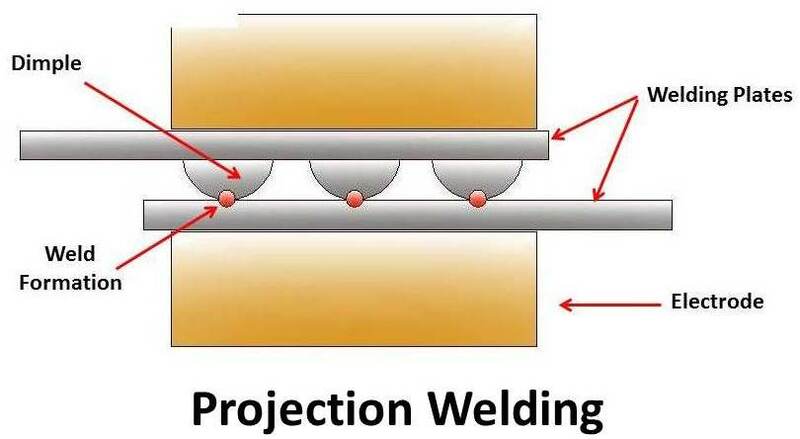 Projection welding is widely used in production of nut and bolt. Seam welding is used to produce leak prove joint required in small tanks, boilers etc. 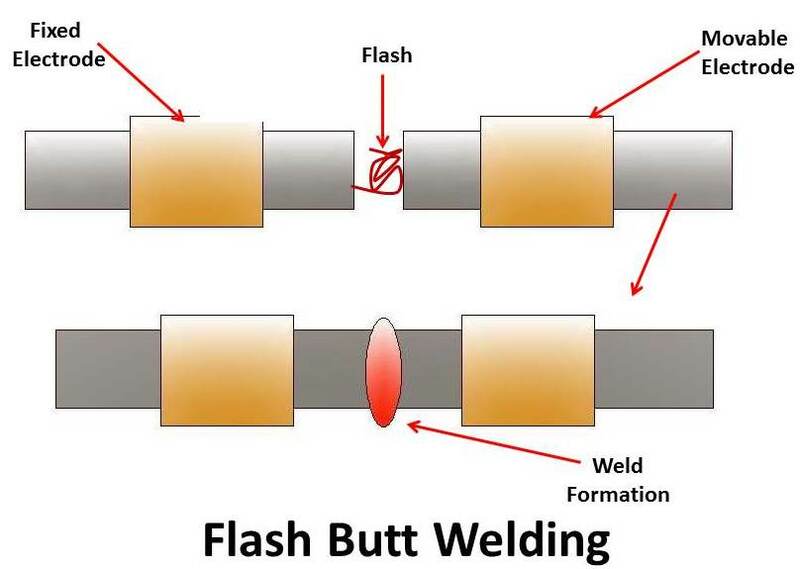 Flash welding is used to welding pipes and tubes. It can weld thin (0.1 mm) as well as thick (20mm) metals. Both similar and dissimilar metals can be weld. The process is simple and fully automated so does not required high skilled labor. It does not require any filler metal, flux and shielding gases. The thickness of work piece is limited due to current requirement. It is less efficient for high conductive materials. Weld joints have low tensile and fatigue strength. This is all about resistance welding principle, types, application, advantages and disadvantages. If you have any query regarding this article, asks by commenting. If you like this article, don’t forget to share it on social networks. Subscribe our website for more interesting articles.